Cooler days have not slowed project progress throughout the South Coast Region. In fact, the fall is often one of our busiest times. Check out the list below of projects on the go in the South Coast Region. 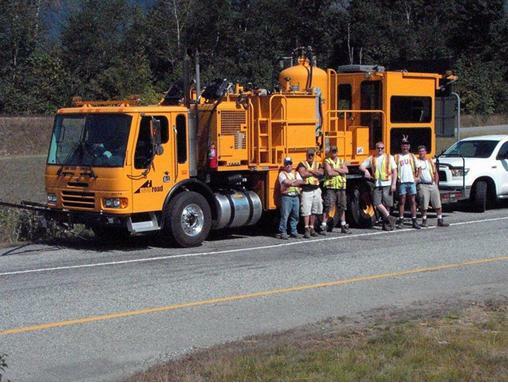 Lining the Way to Safety – When the grey days of winter descend on the Lower Mainland, the work of the Mainroad Pavement Marking will be a sight for sore eyes. Crews have been hard at work this summer throughout the region identifying and refreshing pavement line markings to keep them in clear view. Highway 7 Road Expansion and Bridge Replacement -Mission, B.C. is getting a new four lane bridge next to the intersection of Highway 7 and Nelson Street. The current two lane highway from Nelson Street to Mission, which is experiencing continued growth, is being upgraded to four lanes in an effort to better handle the increased volume. The highway west of Nelson will be upgraded in the future as part of our longer term plans to 4-lane Highway 7 from Maple Ridge to Mission. Hemmingson Creek Culvert Replacement – Located on Lakeshore Road just off of Highway 4 (west of Port Alberni), this project involved the complete replacement of a deteriorating culvert with an 18m concrete boxgirder bridge. We would like to thank Hazelwood Construction Services Inc. located in Nanaimo for undertaking the work. Resurfacing South Coast Roads – Weather and traffic provide a lot of wear and tear on our roadways and as a result, road resurfacing is part of our continual maintenance program. 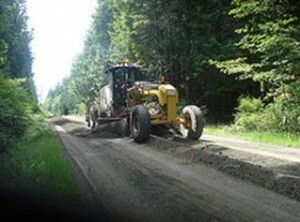 Highway 13 in Aldergrove (also known as Bellingham Highway), was completely resurfaced between 0 Ave and 56th Ave. These upgrades will help extend the service life of the road. Our thanks to Columbia Bitulithic for their work on this project. Cortes Island Roads Receive a Refresh– Emcon Services have been hard at work in the Gulf Island Community of Cortes recently. Twenty-two kilometres of road surface were reconstructed by mulching the existing road, adding crushed gravel and finishing the surface with an aggregate seal. Now the locals will have a reliable ride home on their fresh country roads. Highway 17 Pat Bay Highway – As the main route between downtown Victoria and the ferry terminal in Swartz Bay, the Pat Bay Highway sees a lot of action. OK Contracting has been hard at work resurfacing the roadway between Tolmie Avenue and Sayward Road to keep it in ship shape for the thousands of travelers that use this key roadway daily.